In 12-inch nonstick skillet, heat oil over medium-high heat. Stir in onions; cook uncovered 10 minutes, stirring every 3 to 4 minutes. Reduce heat to medium-low. Stir in salt, brown sugar, and vinegar. Cook 30 to 35 minutes longer, stirring every 5 minutes, until onions are deep golden brown (onions will shrink during cooking). Cool slightly. Heat oven to 325°F. Place bread slices on ungreased cookie sheet; spray lightly with non-stick cooking spray. Bake 6 to 9 minutes or until crispy. Meanwhile, in small bowl, combine goat cheese and cream cheese; blending until smooth; set aside. 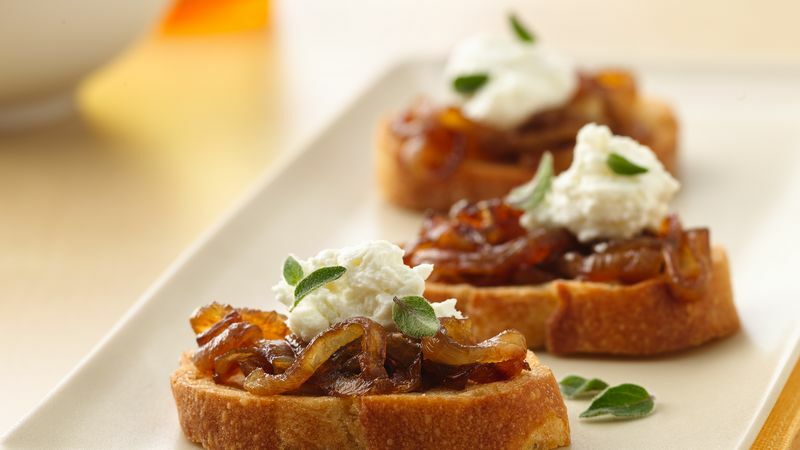 Place 1 teaspoon caramelized onions onto each bread slice; top with 1 rounded teaspoon cheese mixture. Sprinkle with herbs. Caramelized onions can be made ahead. Prepare as directed, then cover and refrigerate; allow to come to room temperature before serving. For longer storage, caramelized onions can be frozen. Spoon the caramelized onions into freezer storage containers, seal, label, date and freeze. Thaw overnight in the refrigerator, then allow to come to room temperature before serving.